Solar power has occasionally been referred to as a “disruptive technology”, and it is becoming increasingly easier to see why. As solar power gets cheaper and more efficient it is destabilizing old systems of energy and industry, particularly fossil fuel based economies. While Donald Trump may have promised to bring coal jobs back to the country, as the prices of the solar fall lower and lower that begins to seem like more and more of an impossibility. The United States Department of Energy recently released a statement which said that the solar industry has hit its utility-scale solar cost target three years early. Utility-scale solar power now costs an average of only one dollar per watt in terms of the electricity generation capacity of the hardware, and only about six cents per kilowatt hour in terms of the cost of the consumed electricity. 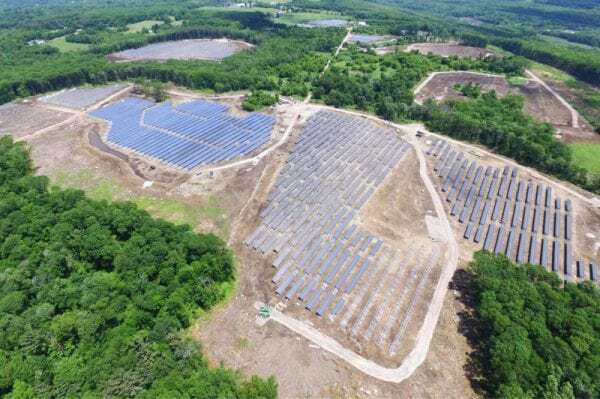 A 16.5 MW DC solar farm constructed near Oxford, MA. Market competition has led to a rapid drop in the cost of photovoltaic equipment and improved efficiency, helped by a research fund from the Department of Energy. In practical terms, this translates into a decreasing cost for both residential and commercial solar installations. Commercial and residential solar power is $0.07 and $0.09 per kilowatt hour away from hitting the Department of Energy’s SunShot goals respectively. The Department of Energy is now gearing up to pursue a new utility-scale solar goal for 2030, but with an emphasis on “reliability, resilience, and storage” over general affordability. 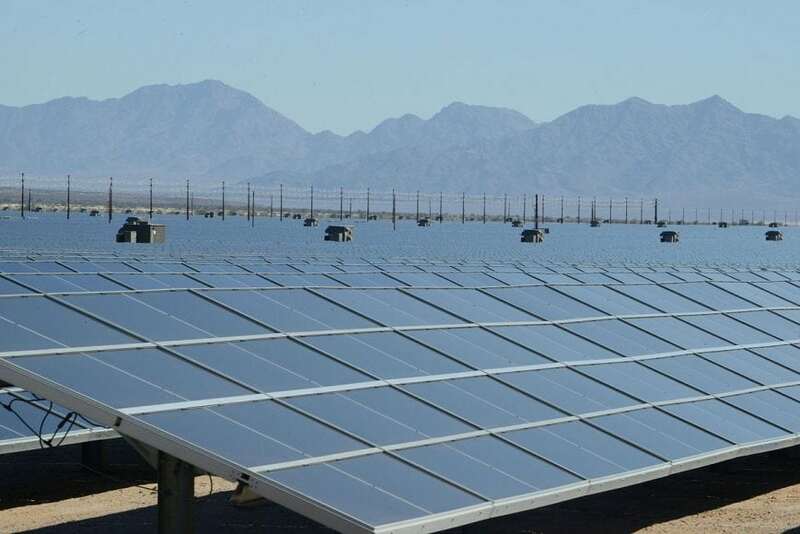 The DOE’s Solar Energy Technologies Office will also pursue research into new technologies to connect solar arrays to the grid, as well as the ability to concentrate solar power through mirrors which would focus and reflect sunlight onto a focused point. The focused sunlight would then be converted into thermal energy which could be used to produce electricity or heat up water. The DOE will be committing $82 million to these research projects. The August 2017 report released by the United States Energy Information Administration states that around 1.4% of all utility-scale energy generated in 2017 was from solar power. As the technology continues to get cheaper, that percentage is likely to grow. Limits for Solar Power Efficiency? As for the continued growth in solar power efficiency, there are some hurdles in the way of scientists working on creating more efficient solar cells. There are practical, physical limits for how efficient solar panels can be, much like there are for computer transistors. Solar scientists are running up against something dubbed the Shockley-Quiesser limit. The Shockley-Quiesser limit refers to a theoretical maximum efficiency for solar cells and hypothesizes that only around 33.7% of all sunlight which hits a maximally efficient solar cell could be turned into electricity. Researchers are looking into ways to get around this limit, and one possible method is through the use of tandem solar cells. Essentially, you would join together multiple solar cells capable of absorbing different areas of the sun’s spectrum. While tandem cells currently improve efficiency up to 40% under ideal conditions, they are very expensive when compared to regular solar cells. The process of singlet fission is also a possible solution to the Shockley-Quiesser limit. New materials have been engineered that are capable of absorbing high-energy photons. Electron-hole pairs move to the material in an excited state and then split into two different photons. Basically, the high-energy photon is split into two different photons of lower energy, which a conventional solar panel is capable of absorbing. The ability to absorb by proxy high-energy photons in this matter leads to an increase in the efficiency of solar panels. While previously restricted to relatively niche applications, the increasing affordability and ubiquity of solar cells enable a much wider range of applications. Recently, auto manufacturer Audi contracted with Chinese solar cell manufacturers to produce solar systems that would be embedded into the roof of their vehicles. Test versions of the vehicle are expected to be on the roads by the end of the year. Solar cells currently aren’t efficient enough to power vehicles over long distances or enable fast charging while driving, but Audi will not be using the solar installation for the vehicles’ powertrain. Instead, it will probably run a variety of accessories such as headlights, air-conditioning, and other devices that draw power away from the vehicle’s powertrain. These rooftop solar panels could also power various functions of a self-driving vehicle. In addition to solar rooftops on some cars, advances in solar technology have enabled the creation of solar windows. Solar windows use a combination of quantum dots and solar cells placed in a panel around the edge of the window to enable the gathering of energy through a transparent surface. Solar windows could substantially increase the amount of energy a building could absorb, as currently most sunlight hits the sides of large buildings, instead of the top of the building where solar panels are traditionally installed. The technology can currently only power a single cell phone, but with more refinement of the technology solar windows could be worth it to mass-produce. Other notable emerging solar technologies include Tesla’s solar roofs, and as 3D printing technology advances research into applications for 3D printed solar cells is also being done. The EPA and solar researchers and engineers appear to be in a difficult position under the current administration. The Trump administration seems to be diametrically opposed to the embracing of lean energy, including acting EPA administrator Scott Pruitt. Pruitt has previously asserted that there is no scientific consensus on the issue of climate change. He has also said that emissions of carbon dioxide do not contribute to the warming of the globe. Pruitt also opposes the Paris agreement, as do many members of the Trump administration including the president himself who withdrew from the Paris accord back in June. Pruitt’s opinion naturally comes in opposition to the scientific consensus on climate change, including evidence which shows climate change is having effects on both sub-arctic and marine ecosystems. Current Energy Secretary Rick Perry has previously expressed doubts about the safety of renewable energy when paired with the electricity grid, even ordering an investigation into the safety of renewable and the energy grid. To make matters worse, all of this comes during a time period where a growing number of people distrust the opinion of scientific experts. Despite budget cuts to the EPA and reduced investments in renewable energy technology, scientists and engineers continue to work on ways to improve the efficiency of solar cells. Political ideology may slow the advancement of solar technology, in the long run, however, it seems unlikely to stop the advancements brought about by market forces and by an increasing global urgency to reduce emissions of greenhouse gases. Projections published in Joule, a new publication devoted to sustainable energy, predict that if current trends continue, by 2050, one hundred and thirty-nine different countries including the United States, China, and the EU, can be powered entirely by renewable sources of energy including solar power.